(Vetch, Crown (Coronilla varia) - 01) Crown vetch, a member of the Pea family (Leguminosae), grows on creeping stems that sometimes mound up to more than a foot in height. 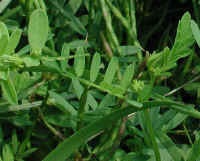 The leaves of the crown vetch, which grow alternately along the stem, are pinnate with 5 to 12 pairs of leaflets. 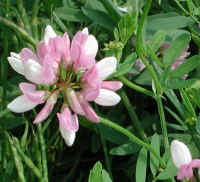 (Vetch, Crown (Coronilla varia) - 01a) The crown vetch flowers are 1/2 inch long and grow in an umbel of 10-15 (or more) at the end of a long stem that grows from a leaf axil. (Vetch, Crown (Coronilla varia) - 01b) The tangled nature of the crown vetch creeping stems makes this wildflower ideal for planting on banks to prevent erosion. In this photo we get a closer look at the leaf structure, with oval shaped leaflets growing opposite one another. The upper right of the photo shows new leaves forming, and new green budded umbels growing from leaf axils. 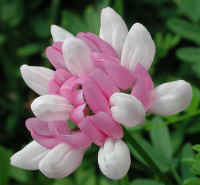 (Vetch, Crown (Coronilla varia) - 02) This is one of the crown vetch umbels that has more than 15 flowers. Each flower is bi-colored with a white incurved keel on the bottom and a pink circular banner or canopy on the top. 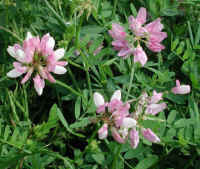 Both the common and scientific names refer to the circular cluster of bi-colored pink and white flowers that looks like a little crown. 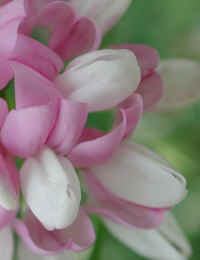 "Coronilla" is Latin for "little crown." 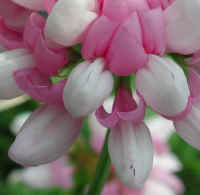 (Vetch, Crown (Coronilla varia) - 02a) In this bee's eye view of the crown vetch flowers, we can see the way the top of the white petal keel is almost completely closed, and how the pink top banner curls upward. (Vetch, Crown (Coronilla varia) - 03) This is another photo of the flowering umbel of a crown vetch. This one has fewer flowers than the previous one. The size of the umbel is about one inch in diameter. (Vetch, Crown (Coronilla varia) - 04) In this bee's eye view of the underside of the crown vetch flower's keel, we can see that it's composed of four individual petals. 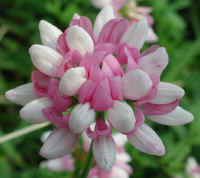 (Vetch, Crown (Coronilla varia) - 05) This is another look at the six petals of the crown vetch flower. 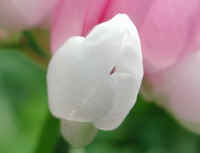 Two pink scalloped petals form the banner and four white petals form the keel of the pea-like flower.